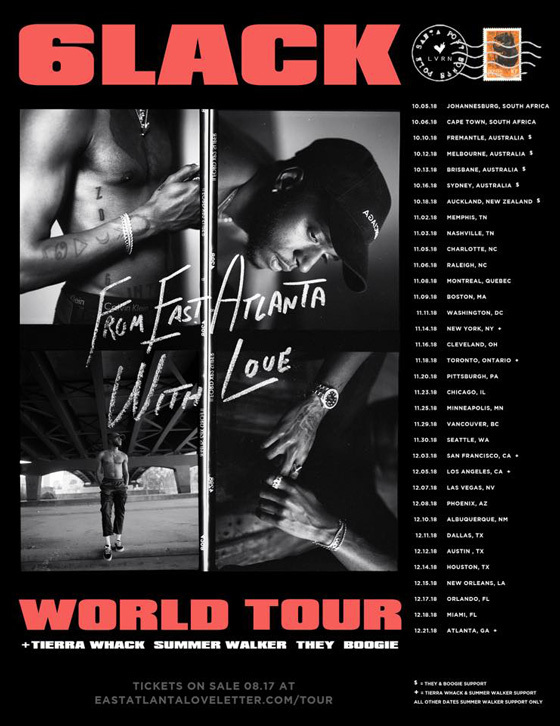 Exactly a year on from mapping out his first headlining tour, 6LACK has now lifted the curtain on a world tour of his own. The artist will spend this coming October, November and December on the road as part of his "From East Atlanta with Love" trek, set to kick off October 5 in South Africa. 6LACK will also bring five different support acts on the run. Five dates in Australia will feature appearances from THEY. and Boogie, while Tierra Whack will appear at shows in New York, Toronto, San Francisco and Los Angeles. All other dates will feature Summer Walker. Canadian stops on the tour will bring 6LACK to Montreal, Toronto and Vancouver in November. Tickets go on sale this Friday (August 17), and can be found here. The tour news comes on the heels of 6LACK announcing the title of a forthcoming full-length LP. As he revealed on Instagram yesterday (August 13), the effort is titled East Atlanta Love Letter. The album, which has yet to receive a release date, follows his 2016 debut FREE 6LACK.